Many have written about the origins of Barolo as a wine, attempting to fix with greater and greater precision, both the date of its birth and that of the principal protagonists of the event, from Marquise Falletti to Count Cavour all the way to French oenologist Oudart. 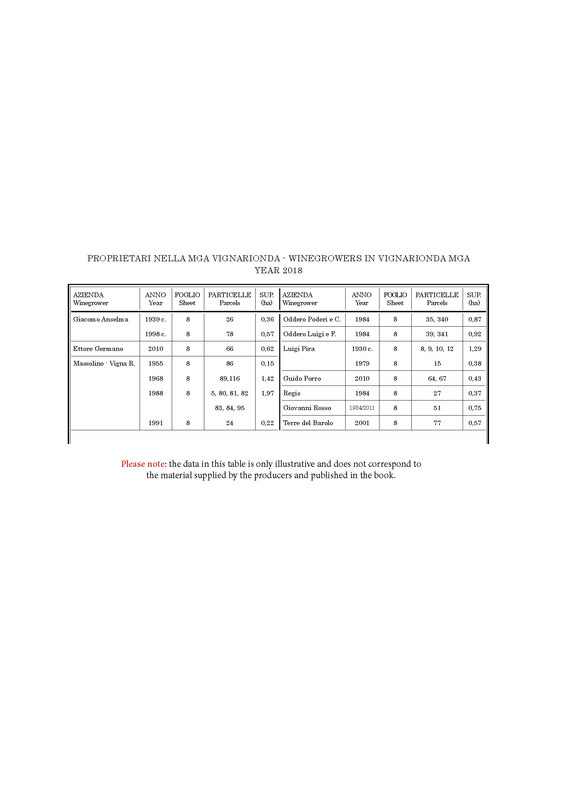 Few, instead, have concerned themselves, and almost never in and, accordingly, as a group of rules and regulations which govern its production, limiting themselves often to a more or less significant listing of the principal dates and events. What was sufficient, nonetheless, to create a substantial divergence between the two inquests: if, in the first case, in fact, the reconstruction has vague and uncertain features, in the second the documentation still available today allows us to trace with a certain precision the course of events both in terms of timing and of development and to demonstrate, without any uncertainty, potential obscure points. 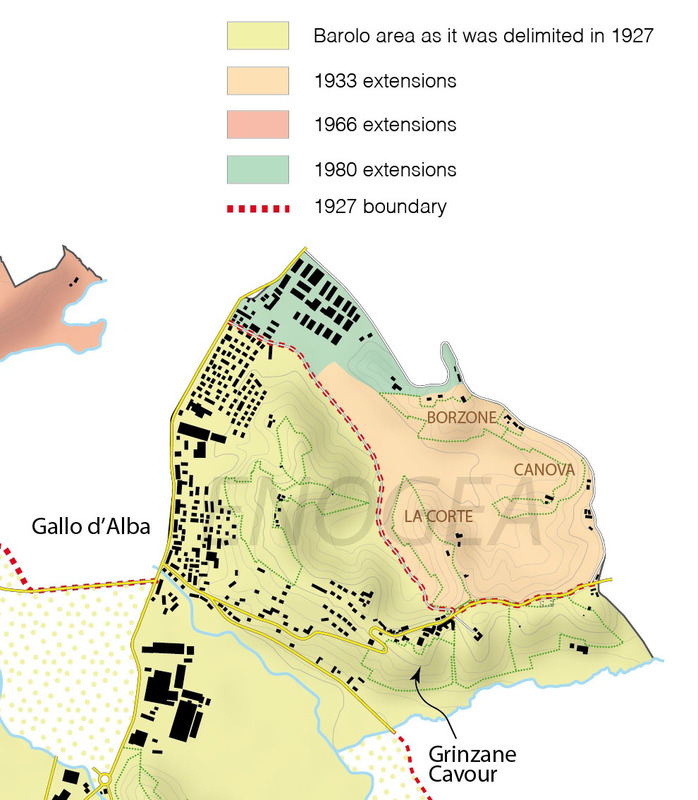 This series of images depicts the original boundaries of the Barolo zone, along with the extensions that have taken place over the years. Within this evolving course of events, what has always been particularly urgent and timely has been the theme of the delimitation of the area of production, which is, effectively, the cornerstone of each and every appellation and the clearest expression of the desire to control and regulate which is its basis. Apropos of this: more than the local patriotism and the often pointed disputes, well described by Renato Ratti in his “Della vigna e del vino nell’albese” (“On the Vineyard and Wine in the Alba Area”) and by Ferdinando Vignolo-Lutati in his essay “Sulla delimitazione delle zone a vini tipici” (“On the Delimitation of Zones of Typical Wine”). It struck me as important to write about the confines and their evolution over time and, above all, to give them a material form in a series of maps. 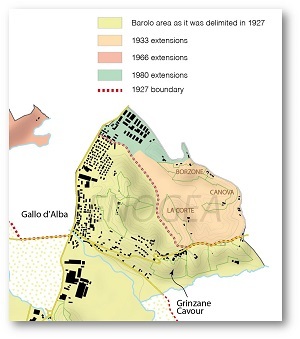 And as well: even if it might seem strange, there have only been extremely rare cases in which the delimitation of the Barolo zone has been accompanied by a precise map accessible to the public (in the first cases there was simply a listing of the townships within the zone) at least until 1966 when the DOC of that year became law. A lack which, on one hand, has already prevented a clear and tangible idea of what, over time, have been the extensions (and, above all, their dimension), and on the other hand has created a fertile ground for hearsay and myths which remain to this day and which we shall put into evidence one by one. 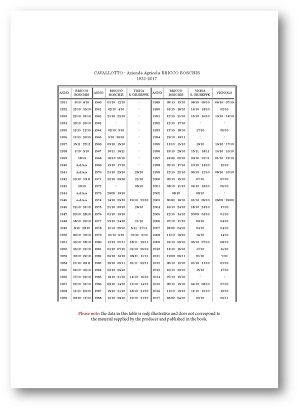 To accomplish this, and with the aim of achieving a reliable – to the extent this is possible – reconstruction of the facts, I have accordingly based my work on the sole appellations officially recognized during the 20th century, all furnished with a description of boundaries which can be checked against current maps and those of the past. Many – I do not wish to conceal this – surprises have appeared and almost as many inaccuracies. The absences and the incongruities between the various versions which have come forth from time to time make this story not merely fascinating to reconstruct but also exciting to recount. And, I hope, to read as well. 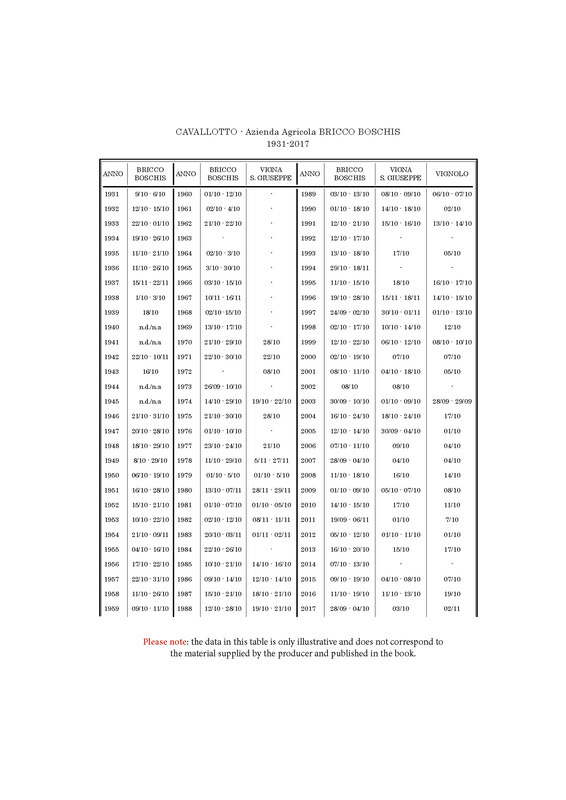 In this excerpt from his forthcoming book, Barolo MGA Vol. 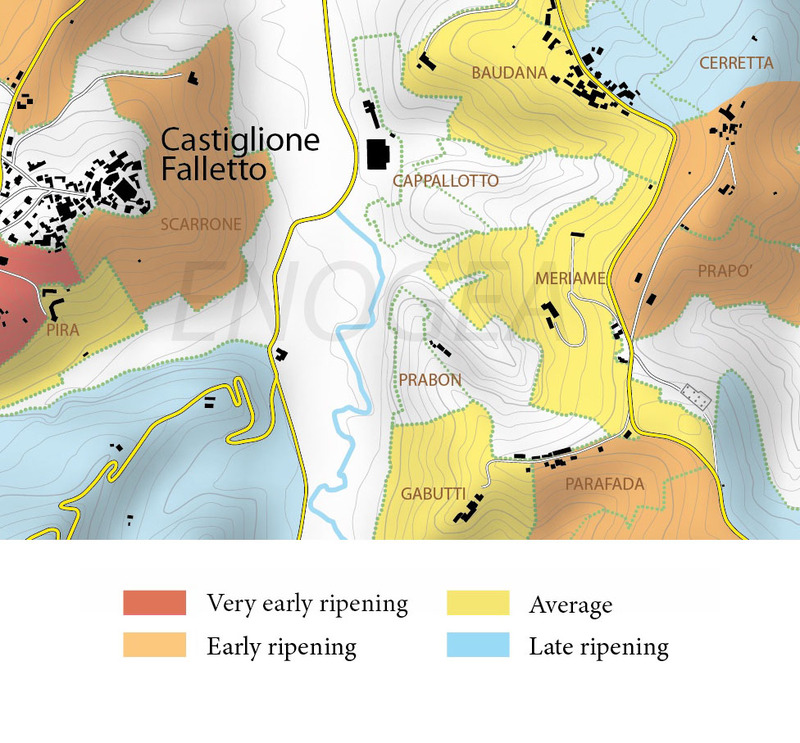 II, Alessandro Masnaghetti discusses the birth of the Barolo Appellation. 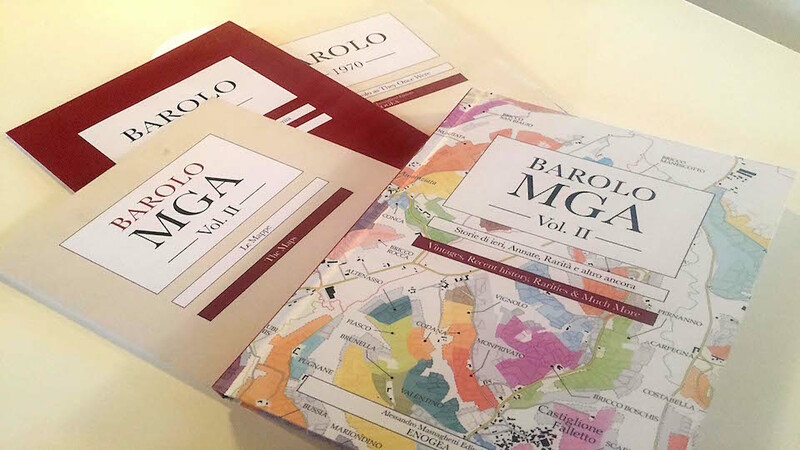 A stunning work of historic significance, Barolo MGA Vol. 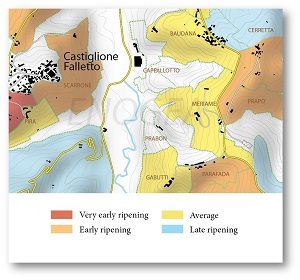 II includes never seen before research on harvest dates, the Barolo 1970 map that compares vineyard areas of present day to those of 1970, a case study of Vigna Rionda and the first English translation of Ferdinando Vignolo-Lutati’s groundbreaking 1929 essay On the Delimitation of Wine Zones and Typical Wines. Barolo MGA Vol. II; Vintages, Recent History, Rarities & Much More is available in the United States through the Rare Wine Co. and through Enogea for readers outside the United States. 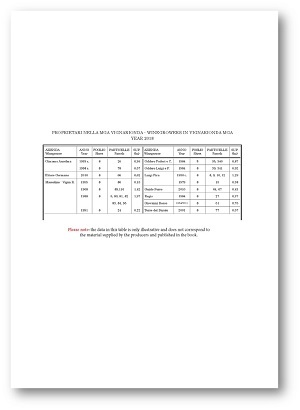 Click the thumbnails below for more detail.